Today I’m starting a new series of articles about non-rocket spacelaunch methods. Non-rocket spacelaunch is the idea of reaching outer space without the use of conventional chemical rockets, which is currently the only method in use. Why non-rocket spacelaunch? Because the current chemical rockets are really expensive. In order to further explore outer space and establish a permanent human presence in space we need more cost efficient spacelaunch methods. In fact, present-day launch costs are in the range of $10,000 to $25,000 per kilogram from Earth to low Earth orbit. This is much too expensive for any serious space colonization efforts. Therefore we need to move beyond conventional chemical rockets and research alternative spacelaunch methods. Each issue of this series will focus on one non-rocket spacelaunch method, starting with the space elevator. The concept was first proposed in 1895 by Konstantin Tsiolkovsky, a Russian-born scientist of Polish descent. He imagined a free-standing tower reaching from the surface of Earth to geostationary orbit. The whole structure would have been 35,790 kilometers tall. Modern space elevator concepts consist of a cable rather than a free-standing tower to reduce the weight of the structure. A base station is where the space elevator cable would be anchored. There are two main types of base station designs for the space elevator: stationary and mobile. Stationary platforms would generally be located in high-altitude locations, such as on top of mountains, or even potentially on high towers. Mobile stations would typically be large oceangoing vessels. 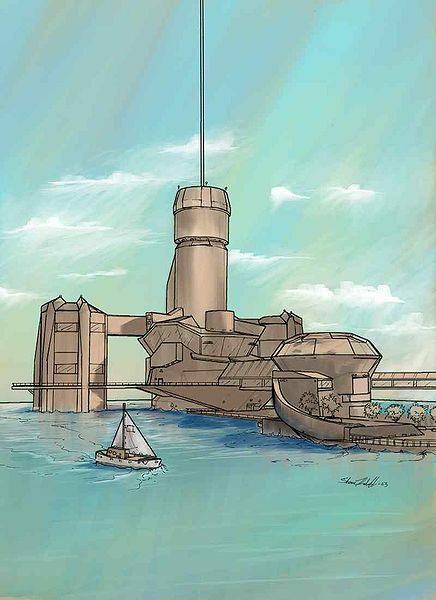 A seagoing base station would also act as a deep-water seaport. Mobile platforms have the advantage of being able to maneuver to avoid hazards such as high winds, storms, and space debris. While stationary platforms don’t have these advantages, they would have access to cheaper and more reliable power sources, and require a shorter cable. While the decrease in cable length may seem minimal (no more than a few kilometers), the cable thickness could be reduced over its entire length, significantly reducing the total weight of the whole structure. 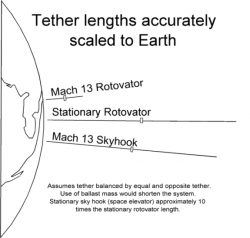 A space elevator cable must carry its own weight as well as the additional weight of the climbers. The required strength of the cable will vary along its length, since at various points it has to carry the weight of the cable below, or provide a centripetal force to retain the cable and counterweight above. Unfortunately conventional materials such as titanium, steel or aluminium alloys are not strong enough for the task. A climber is a vehicle that climbs up the space elevator cable. Most climbers designs propose to use pairs of rollers to hold the cable with friction. Climbers must be spaced at optimal timings so as to minimize cable stress and oscillations and to maximize throughput. Lighter climbers can be sent up more often, with several going up at the same time. This increases throughput somewhat, but lowers the mass of each individual payload. Another design constraint will be the ascending speed of the climbers. 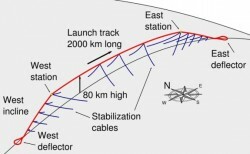 As geosynchronous orbit is at 35,786 km, assuming a climber can reach the speed of a very fast car or train of 300 km/h it will take about 5 days to reach geosynchronous orbit. If this speed limit cannot be exceeded, the space elevator would be mostly for lifting cargo, while passengers will probably choose another spacelaunch method. However future technological breakthroughs could change this. Transfer the energy to the climber through wireless energy transfer while it is climbing. Transfer the energy to the climber through some material structure while it is climbing. Store the energy in the climber before it starts—this requires an extremely high specific energy. The first method is laser power beaming, using megawatt powered free electron or solid state lasers in combination with adaptive mirrors approximately 10 meters wide and a photovoltaic array on the climber tuned to the laser frequency for efficiency. For the third method, nuclear energy and solar power have been proposed. However generating enough energy to reach the top of the elevator in any reasonable time without weighing too much is probably not feasible. A major obstacle for any climber design is the dissipation of the substantial amount of waste heat generated due to the less than perfect efficiency of any of the power methods, as well as the friction with the cable. Capturing an asteroid is no easy task, so the first solution is not as practical as it seems, even-though it would shorten the cable considerably. A space dock, space station or spaceport positioned past geostationary orbit is in my opinion the best solution, as it would be both efficient and practical. 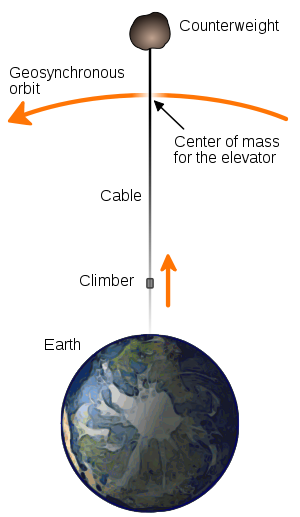 Extending the cable far beyond geostationary orbit is also a good idea since a payload that went to the end of the counterweight-cable would acquire considerable velocity relative to the Earth, allowing it to be launched into interplanetary space. With a huge structure as the space elevator many things can go wrong. Therefore it should be made more redundant in order for it to be safer. Many other safety measures should also be taken. Part two of this article will focus on this issue more extensively. 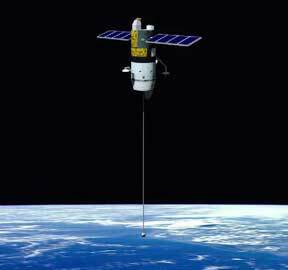 Earth is not the only planet that could have a space elevator. 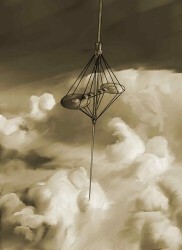 Variants of the basic space elevator design could also be built on other celestial bodies in the solar system. Part three of this article will focus on this concept more extensively. A fourth part to this article will list the occurrences of space elevators in works of fiction. Excellent article/introduction, I am anxiously looking forward to the next ones. I thought this was a joke when I first stumbled it, but it was really interesting. Thanks. Never thought about this concept before.